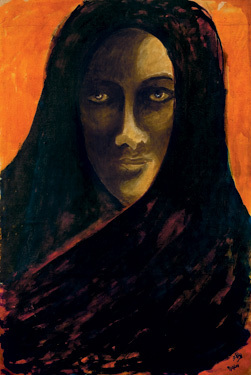 'Untitled' by Rabindranath Tagore is part of 'The Last Harvest' show of the artist's work at the Art Institute of Chicago. There are certain movies that grab ahold of you and never let go, and such was the case when I first watched The World of Apu, the 1959 film that closes out Satyajit Ray’s Apu trilogy. Apu&apos;s world is 1920s Calcutta, made a bit more familiar via the well-worn path of the coming-of-age narrative. Apu, in his 20s, has neither a job nor much sense of his future, though he dreams of becoming a writer. Through one of the stranger "meet cutes" in cinematic history, he winds up marrying Aparna, a woman whose intended turns out to be mad but whose marriage must go on, lest she wind up cursed for life. Though they wed thanks to chance, Apu and Aparna of course fall deeply in love, a plot turn made achingly real in their small, tender interactions. In the scene I&apos;ll never forget, they see a movie together (the Ray archive in Santa Cruz thinks it is the 1913 “mythological film” Raja Harishchandra, which apparently is the very first work of Indian cinema). Apu looks thrilled with the cheesy effects while Aparna appears bored. Ray then cuts from a shot of the movie-house screen to a small window in a carriage carrying them home, which, filled with the sparkling lights of the city at night, resembles a film screen in miniature, rolling along between the two. Movie-style and real-world romance come together. Audiences around the world connected to the romantic and tragic air of the Apu films - they won awards at many international film festivals and are still considered some of the most significant works in movie history. That hasn&apos;t been the case for a figure who had a considerable influence on Ray&apos;s worldview and body of work, the poet, musician and artist Rabindranath Tagore, a Bengali cultural figure active in the late 19th and early 20th centuries. But a couple of events in Chicago might help elevate his profile. Tagore/Ray: Films Screenings and Symposium is a two-day event exploring the aesthetic and political connections between the artists. The screenings include two of Ray&apos;s adaptations of Tagore&apos;s work (Ghare Baire and Charulata), a documentary Ray made about Tagore, and a film work by Tagore himself, Natir Puja. Organizer Dilip Gaonkar, who heads the Center for Global Culture and Communication at Northwestern University, considers Ray a "great artist of India’s transition, from tradition to modernity." He sees a powerful connection between Ray and Tagore in their critical view of certain currents of modern life, especially nationalism, which is the theme of Ray&apos;s 1985 film Ghare Baire (the English title is Home and the World — it screens Thursday night). A different view of Tagore can be found at The Last Harvest: Paintings of Rabindranath Tagore at the Art Institute of Chicago, an exhibition of 61 works by the writer, who only started to paint in his 60s. Though many Chicagoans may be encountering these works for the first time, Tagore has been here before. Dipesh Chakrabarty, a historian at the University of Chicago, discovered Tagore gave a lecture at the University in January 1913, less than a year before he become the first non-Western to win the Nobel Prize in Literature. Chakrabarty told me Tagore was in the Midwest at the time, visiting his son who was getting a PhD in agriculture at the University of Illinois in Urbana-Champaign. His visit came just as Harriet Monroe was publishing six of Tagore&apos;s poems in translation, in the third edition of her magazine Poetry. When his son reached out for some copies of the magazine, Tagore&apos;s whereabouts were revealed, and eventually he was persuaded to give a talk in Chicago. While here, Tagore befriended Harriet Moody, an entrepreneur, artists&apos; patron, and widow of a Chicago poet and English professor William Vaughn Moody. Chakrabarty characterizes their friendship as deep and immediate. He described Moody&apos;s recollection of Tagore&apos;s arrival at her house, dressed in a long robe, with snow falling on his "black velvet cap" and "flowing grey beard." The poet unlike "others [who] immediately moved to the more obscure parts of my living room ... just came straight to me and talked." Moody found "communion" with Tagore, and he in turn found someone who would indeed "listen to him, to all his thoughts." As for how far things went, Chakrabarty says he found no evidence of a sexual or "typical" love affair. But "friendship&apos;s a complex thing, not everything gets expressed in words or letters, [and] I can&apos;t claim to be getting at the whole of whatever was transacted between them." The two did remain lifelong friends, renewed by Tagore&apos;s return visits to Chicago and their encounters in Rome and London. As for Tagore&apos;s impressions of Chicago, not much is known. Chakrabarty says this might be chalked up to Tagore&apos;s tendency to live not so much in the world as "inside his head." You can catch a glimpse of his mindset at the Art Institute exhibition through April 15th and at the Tagore/Ray symposium. The latter event is free and open to the public; it runs Thursday and Friday at the McCormick Tribune Center Forum on the Northwestern University campus. And listen to my full conversation with Professor Dipesh Chakrabarty here.